This line is open for freight between Dalrymple Junction and Chalmerston near Dalmellington. A section was recently opened from Holehouse junction to the Broomhill Opencast site, but is presently seeing little use. The line also includes the section from Falkland Junction in the north of Ayr through the new Ayr station to Dalrymple Junction, still in use for passengers and freight for Stranraer. 'Pug' at the Burnton washery. This line runs through southern Ayrshire uphill past former coalmines to the former ironworks at Waterside and on to Dalmellington. The climb was severe for trains in the days of steam. From Dalmellington to Ayr. The line is electrified from Falkland Junction to Townhill depot immediately south of Ayr station. The line is single track from Falkland Junction to Dalrymple Junction and single track from there to Waterside and on to Chalmerston. There was a single track branch from Holehouse Junction to Belston Junction was reinstated and re-opened from Holehouse Junction to Broomhill in 1998, but now appears out of use. This is a north facing junction with the Glasgow, Paisley, Kilmarnock and Ayr Railway. To the south of the junction and to the west (and lesser extent east) of the main line is Falkland Yard which is kept busy with local coal trains in connection with the opencast mines and Ayr harbour. The yard leads to lines to both Newton Junction and Ayr Harbour. This is a two platform station in the north of Ayr. It is served by every alternate service between Glasgow and Ayr. This is a 'double' junction immediately to the south of Newton station. Immediately south of the station lines from the harbour (to the west) join the main line at a south facing junction. Slightly further south the line passes under a roadbridge (where there was the very high Newton Junction signalbox removed during the signaling associated with electrification). On the other side of the roadbridge is the north facing junction with the Ayr to Mauchline Branch which runs east from here. This line also has a connection to the Ayr Motive Power Depot. This was a steam shed. The depot is enclosed between the junctions at Newton Junction, Hawkhill Junction and the former Blackston Junction. These junction form a triangle around the shed which were used for turning engines. Lines from the shed join at Newton Junction and Hawkhill Junction. The original shed was designed by the engineer of the line, Mr Galloway. The depot is still open and maintains DMUs and locomotives. 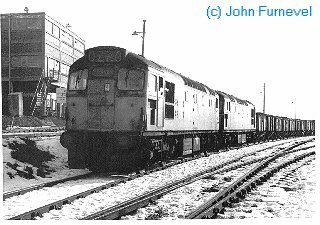 This is a south facing junction for Ayr Motive Power Depot and formerly the Ayr to Mauchline Branch. Today this is the main station in Ayr, and has been since 1857 when service from Glasgow to Ayr were relocated to this station. The station has a partial glass-roof (partly cur back), bay platforms at the north end for services to Glasgow and two through platforms. To the north of the station the line crosses the River Ayr. The station is also known as Ayr (New) or Ayr Townhead. The line is electrified to by these sidings which are used for EMU storage and maintenance. The sidings are approached from the north into a reversing spur which which the trains reverse into sidings. There were sidings here before the sidings were used for EMU maintenance. This was a north facing junction. The Maidens and Dunure Railway joined the main line from the west. There was a branch from near Alloway Junction to the Aila Mental Hospital, to the east of the main line. The junction with the main line faced north. This is a north facing junction with the Ayr and Maybole Railway. Before extension of the Maybole line south to Girvan there was a station here called Maybole Junction. This fine viaduct is immediately to the west of the former Potterston Junction, by Hollybush. From here a line ran, from an east facing junction, north east past Martnaham Loch to the Sundrum Colliery at Coylton. The line is closed. The line passed through Coylton with a level crossing to run north to the Sundrum Colliery. 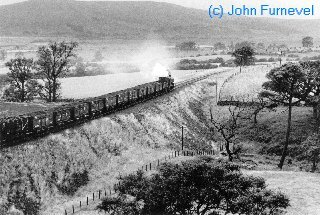 The line ran to the Water of Coyle, nearly to the south bank while the Ayr to Mauchline Branch was on its north bank at Trabboch. The line is closed. This was a single platform station. The building is now a house. This was south facing junction with an exchange platform in the 'v' of the junction. The signalbox was to the south of the station mounted at the top of a deep cutting which is subject to snowdrifts in winter. From here a branch of the line ran east to Belston Junction. This section was closed and lifted in the 1960s, but re-laid as far as Broomhill (an opencast mine site) in 1998. This section has fallen out of use again and has been lifted. There was a tramroad line from just to the south of here (junction faced north) to one of the ironstone mines on Bow Hill. This was a loading pad for the Broomhill Opencast Mine to the east of Holehouse. This short branch from Holehouse re-opened in 1998 but has fallen out of use again. This was a station. The embankment of the line here and bridge over the B730 has been removed. There is a farm by the former station of the same name. This colliery was approached from a west facing junction. The section from Littlemill Colliery to Holehouse was closed in the 1960s leaving the colliery to be approached via Annbank, Drongan, a reversal at Belston Junction and another reversal to enter the colliery. The colliery and lines are closed. This site of this station is now a carpark. To the east of its site is a viaduct. A coal washery existed here, probably to the south of the station on a branch whose junction with the main line faced east. This colliery is closed. It was served by a line from a west facing junction. The colliery was connected to another at Greenhill by an aerial railway. This was an east facing junction with the Ayr to Mauchline Branch. This station had a single platform. It was relocated from a site slightly further north. At Drumgrange there was an incline from the low level Ayr and Dalmellington Railway up the hill to Drumgrange where there was a winding house. This originally ran directly off the public railway. It was later re-aligned and doubled and ran from the Dalmellington Ironworks' own internal railway system. There incline can still be clearly seen and te brick supports for the winding drum still stand at the top of the incline. along with the humps. Nearby are the laid low remains of the hilltop villages, most associated with the former iron ore mines which were at the high level in this area. The station still stands, unused. 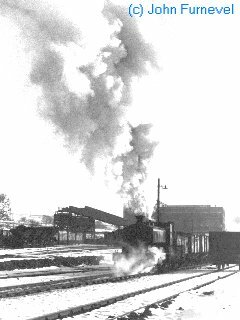 Train at the Burnton washery, Waterside, on 1 December 1969. 'Pug' and train approaching Waterside. To the south of Waterside station was the former Dalmellington Ironworks established by the Houldsworths of the Coltness Ironworks. The location of the works is also known as Dunaskin or Barbeth. There was an extensive private railway system which connected the ironworks to various coalmines at both a higher level, and via an inclined plane, a very much higher level. There were mining villages (Burnfoothill, Lethanhill and Benquhat) established in the hills which have now all but gone. The site of the ironworks is now a museum. The ironworks was bankrupted by the working out of local Iron Ore mines and a series of coal mine strikes. The working of imported Iron Ore from Ayr to Waterside was difficult due to the steep uphill gradient. The works, in the hands of William Baird and Co. were closed and the area given over to mining. To the south of the former ironworks was the substantial Burnton washer for coal, this was connected by the private railway system to coalmines. A line ran south to Minnivey (still open this far), Chalmerston, Pennyvenie and Beoch. Another ran north to Dalharco Pit (by Patna) and Houldsworth Mine (above Polnessan). There was a link from Waterside (at a south facing junction) to the high level system (at a north facing junction by Burnfoothill). This link was an inclined plane. The higher level system ran from mines at Kerse (Bow Hill ironstone mines), in the north to Burnfoothill, Lethanhill, Benquhat and Craigmark. Much of the system was at high level and could be blocked by snow in the winter, this would lead to temporary closure of the mines until the snow was cleared. The early version of the incline (1860s) and upper works line originally followed a slightly different route, starting from the west side of Waterside station and running up, via a pit to Lethanhill. Another tramway, following the course of the burn uphill from nearby Drumgrange, met the incline half way up. Just south of Lethanhill the line split with one part running north to Polnessan burn and the other part running briefly north, crossing over the north branch before running east to Lethanhill. At Lethanhill there were two southwards branches to pits. The incline route was later relaid and Burnfoothill junction remodelled. The lines were worked by steam engines ('pugs') until closure of the mines in the 1970s. An opencast site has opened at Chalmerston. The line from Waterside to Minnvey remains intact to serve an opencast site, called Chalmerston where there is a loading pad. Minnvey is the site of the Scottish Industrial Railway Centre which has it's own single platform station and collection of engines and wagons. The line from Waterside to Dalmellington is closed and lifted. The station site (a single platform with run-around loop) has been redeveloped at an industrial estate. There was a two road locomotive shed here. The Government funded a School of Aerial Gunnery which was established at Loch Doon to the south of Dalmellngton. This had its own railway and rail mounted targets. The site was abandoned before being brought into use due to unfavourable wind conditions, this was a scandal at the time due to the expense of the works.